I keep a file of notes and ideas related to wine in general that catch my eye and that one day may lead to articles or stories or events or posts of one sort or another. One tear-sheet in that file is a full-page full-color ad that I found in the June/July 2009 issue of Cookie (my previously-favorite parenting magazine that Condé Nast, in its dubious wisdom, decided recently to cancel alongside Gourmet). the Sum of my RESPONSIBILITIES. I am true. I am ALIVE. wine needs time to breathe. I tore out this ad not in order to remind myself to buy Turning Leaf Chardonnay (though, as a member of their target demographic, I must admit the ad successfully made an impression). I tore out the ad because it was, to my eyes and experience, innovative. Innovative, because it featured a lone woman. Because the wine itself was only the subtext. Because the affiliated website—HowDoYouBreathe.com—mentions neither the brand nor even the genre of product. Because there is only a tangential relationship (that of “breathing”) between the copy within the ad and the object of sale. The ad is representative of what marketers, I believe, call a soft sell. And I was prompted to reconsider just why the Turning Leaf marketers went the soft and subtle route thanks to a recent class at the Boston Wine School. Jonathon Alsop of the Boston Wine School kindly extended an invitation to a tasting event called “Wine, Women & Respect: The Nuances of Marketing Wine to Women,” organized and taught by Doris Hamner. (Full disclosure: I know Doris Hamner. She makes me laugh, she is my friend. We drink wine together.) Knowing Doris’s background—in wine and as a PhD in sociology—I was keen to hear her thoughts on a subject that I think about often too. That evening in October, Doris presented study after study indicating that the majority of women are less concerned with number-based, “end result” wine ratings. As a group, women tend to be more concerned with what can be called the life cycle of the wine—from the history of the winery and the philosophy of the winemaker to whether the wine goes well with what’s for dinner and whether it simply tastes good. The point I took away from this class was that wine marketers interested in appealing to women need to pay more attention to the the kaleidoscope of nuanced preferences that women exhibit toward wine. 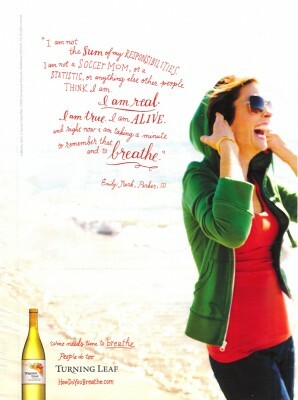 The Turning Leaf ad underscores how effective—subtly effective—the marketing of wine to women can be. I salute wine companies like Turning Leaf that are making that effort, and I salute Doris Hamner and the Boston Wine School for opening the door to the conversation. — Cathy Huyghe coordinates the Web site, http://365daysofwine.com covering food and wine throughout the Greater Boston area. It’s lovely, it’s creative…it has to be, because it is very difficult to sell Turning Leaf Chardonnay on its own merits.